2/11/2009: David Minnick was interviewed for All About Jazz. Click here to read the whole interview. 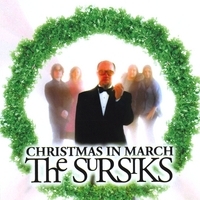 12/12/2008: The Sursiks' 3rd cd, entitled Christmas in March is now available through CDBaby. "Christmas in March", uses found recordings from tv (shows, commercials, infomercials, news), radio (dj banter, news, weather, interviews), self-help and self-hypnosis recordings, children's lps, religious recordings, political speeches, stand-up comedy routines and more as the source material for its songs. The original recordings are taken apart and re-arranged in order to create new absurd, funny and bitingly satirical narratives which creatively reflect on the very material from which they're made. But then, The Sursiks take it one step further: The spoken parts are rhythmically and melodically tied to the musical arrangements, and throughout most of the songs they RHYME! "Christmas in March" is a collection of pop-culture mashups which imitate the rhythm, phrasing and rhyme schemes of poetry and songs, set to music by a real band! 3/22/2008: Read a review of The Sursiks' Lydia Grace at Spunkybean.com! 3/28/2007: The Sursiks are at it again! Their second release, Lydia Grace, is available now at CDBaby! "Lydia Grace" is a collection of 13 songs actually written and sung by a 3-year-old girl. She was not told what to sing, or even what to sing about. If you loved the first Sursiks CD, but didn't want to play it when the kids were home (on account of all the swearing and the naked guy on the cover), you'll love Lydia Grace (and your kids will too). Click here to read more and to listen to samples. 2/14/2007: ZERMOS has been reviewed in All About Jazz. Check it out. If you haven't purchased your copy yet, or if you just want to hear some of it before you buy, click the picture of it over on the left there! 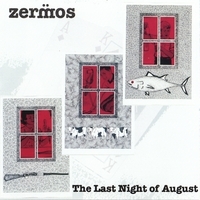 12/17/2006: Just in time for the holidays, the Zermos CD is now available at CDBaby. 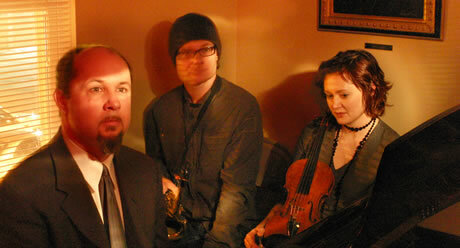 11/23/2006: The first CD from Crabid Jazz artists Zermos will be coming out within the next 2 weeks. An announcement will be posted here when it's available on CDBaby. In the meantime, check out the other fine Crabid Artists and please continue sending the Crabid Tiger your fanmail. 8/19/2006: Crabid Chris has been busily digitizing and posting the complete Gangster Fun video archives to Google video. If you enjoy these, please consider paying for them by purchasing a CD from Crabid. 8/8/2006: Crabid has a new Myspace profile. Come be our friends and listen to some cool new stuff. It's free, and it's Crabid. Don't be scared. 6/6/2006: The Sursiks Reviewed on All About Jazz! Brad Glanden has written a very nice review of "I Didn't Know I Was Singing" for All About Jazz. Check it out. We've had requests from people interested in buying multiple copies of CDs. If you'd like to buy more than 5 copies, please email us and we can sell them to you directly and save us both money. Thanks! 5/10/2006: The Sursiks' CD has been reviewed by CDBaby, and will be featured on the homepage of CDBaby.com on Tuesday, May 16. Read the review here! 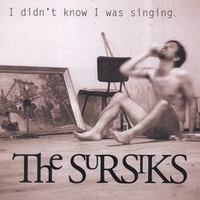 5/9/2006: The debut CD by The Sursiks: I Didn't Know I Was Singing, is available NOW at CDBaby. Click here to buy. Oven Mitt Johnson has gone into hiding. 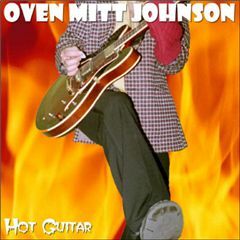 Rumor has it he may be working on a follow-up to his critically-aclaimed debut: Hot Guitar. Mudflap is still working on its first CD of the Truckin' Songs you didn't grow up with.